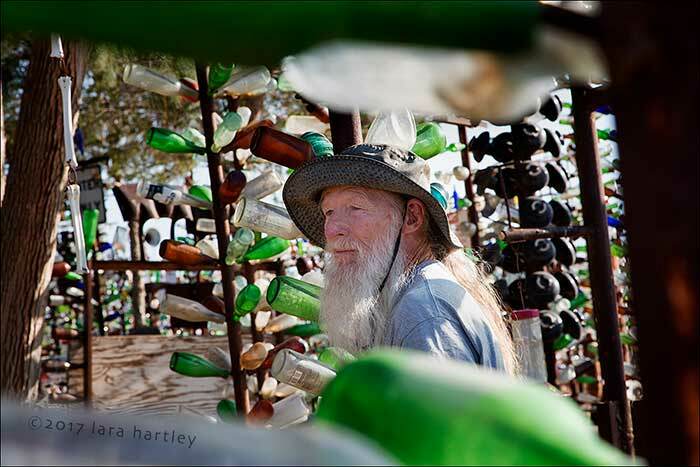 Elmer Long, the creator of the unique Bottle Tree Ranch on Route 66 wanders through his glass bottle tree forest. Elmer often comes out and talks with visitors. Sunlight pours through thousands of jewel-toned glass bottles: Royal blue, root-beer brown, emerald green. Enhancing the stained-glass window light is the deep-throated ringing of a large wind chime; echoed by the tinkling bells of smaller chimes. And a cowbell. And a pipe banging up against another pipe. The overwhelming feeling is one of standing in a grand cathedral of luminance and heavenly, if discordant, sound. It started simply enough. 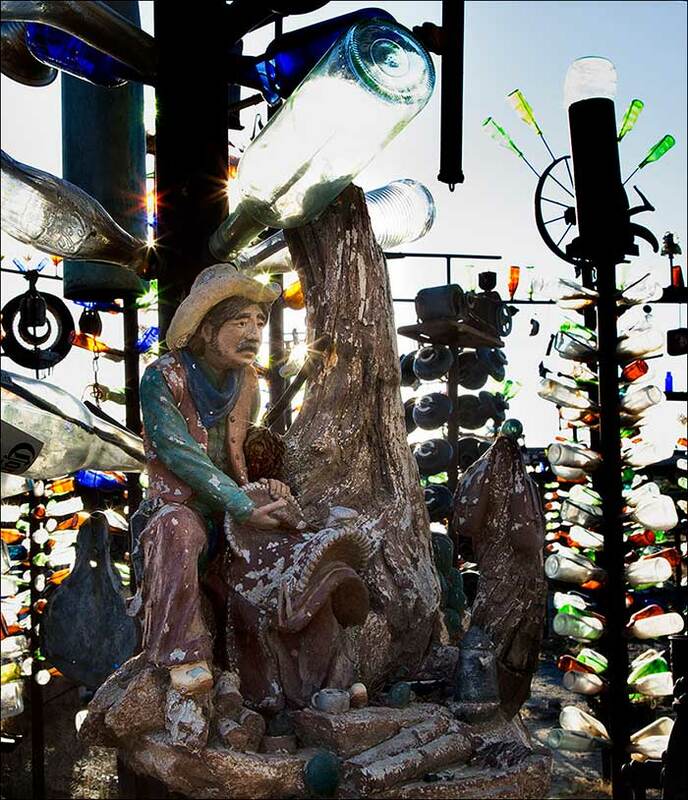 Elmer Long and his dad, also an Elmer, had collected thousands of bottles and other artifacts on their frequent camping trips to the desert from their home in Manhattan Beach. As his dad got older, he started to give the bottles away. 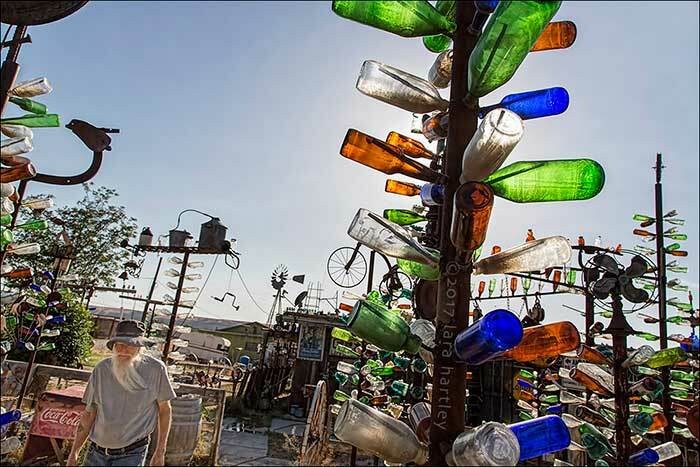 Elmer decided to save the collection and moved the remainder of the bottles to his home on Route 66 near Oro Grande, Calif. He built his initial tree in about 2000. After building the first tree, he liked it so much he went on building more and more until he doesn’t know how many there are now. “I don’t keep track,” he said. Somewhere back there is Elmer’s house. You can’t see the house for the trees. “And you don’t have to water bottle trees,” he added with a grin. Elmer has lived in this house at different times in his adult life, but this time around he said he has been here about 35 years. “When I was young, in my 20s,” Elmer said, “I was always thinking about how you work for a place your whole life, theoretically. You get retirement, you get Social Security. “I bought this house,” he continued. “This was my third house. My wife and I lived here one year, had one boy here, then we moved and bought more houses. Every time we bought one, we moved. That’s what happened. We talked about where Elmer got his bottles. He said, at first, they all came from private dumps on ranches or other large parcels. The owners would let his dad rummage through ravines where people had been tossing their trash for generations. and barely noticed in the sparkling light starbursts. “Maybe the man’s grandfather did it. There were some old bottles. My dad zeroed in on the bottles. Dear old Dad,” Elmer said. Now he gets bottles from all over the world. 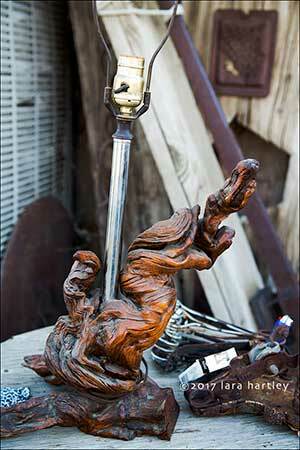 One welded pipe tree is shaped like a cactus, “With bottle flowers,” said Elmer. Our talk gravitated to pieces I liked best and artifacts he liked best. I was drawn to a vintage-looking pink-glass hummingbird feeder. 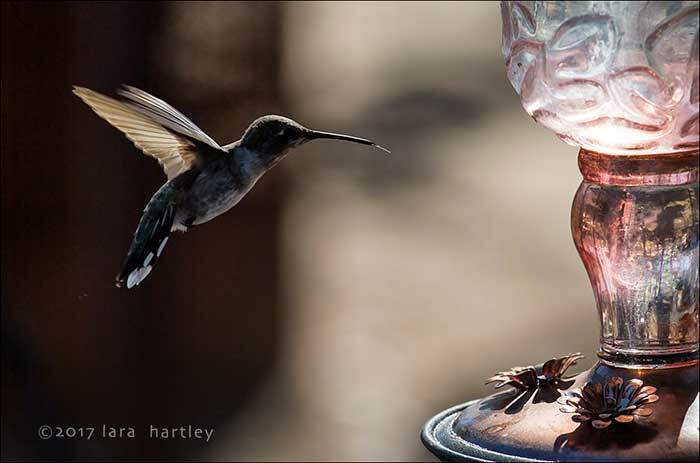 It gathered light and hummingbirds — the afternoon sun turning it to rose tourmaline. On one particular trip to Death Valley with his father, a teen-aged Elmer found a dead tree. He said he pulled and dug, dug and pulled and finally was able to get the dead tree root out of the ground. “My dad made a lamp out of the tree and its root system. He tore apart my bicycle pump for the stem of the lamp. “You look at something [like the lamp] and say that is ‘kind of cool.’ I can look at it and say ‘I was going into high school that fall, 1960, or 1959. Elmer doesn’t think of himself as an artist. He says he is just someone who thinks of what they want to do and then does it. I tiptoed through the metal trees feeling a bit like Alice in Wonderland, trying not to back into any bottles. The wind was dying down and the grove was almost quiet except for the chittering of birds in the branches of both the bottle trees and the shade trees near the road. Hummingbirds hovered over a dozen or so feeders. You can move this way and that on paths between the trees, watching the trains, the visitors; enjoying all the things Elmer has collected and built. Everything is bathed in brilliant bottled light. “It’s a crazy world, and it’s mine,” he said.